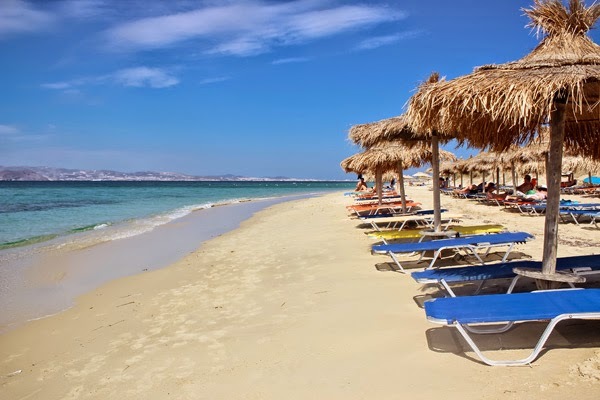 As mentioned previously, when I was searching for beautiful beaches near Mykonos and Santorini, I came across Plaka Beach and that sealed the deal for me to stop in Naxos. It looks exactly as beautiful as the photos I saw online which persuaded me to visit. Like Mykonos, the sun was out but the water was cold. 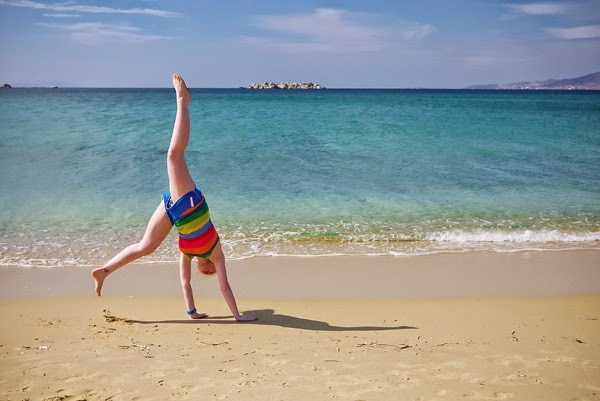 Since we only spent 2.5 days in Naxos, checking out 3 beaches is not a bad statistic. St. George Beach is the nearest beach from town. It is a 4 minute walk from Hotel Blue Sky. I took it for granted because it was so near from our hotel and just passed by to take some photos. Since I used to be a sand snob, I didn’t spend much time here. 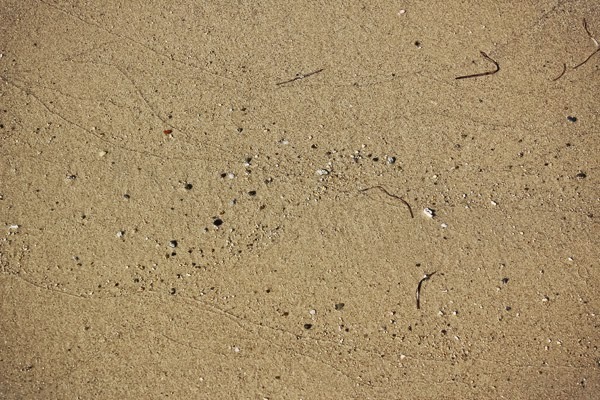 The sand color is a mix of brown, gray, and cream. 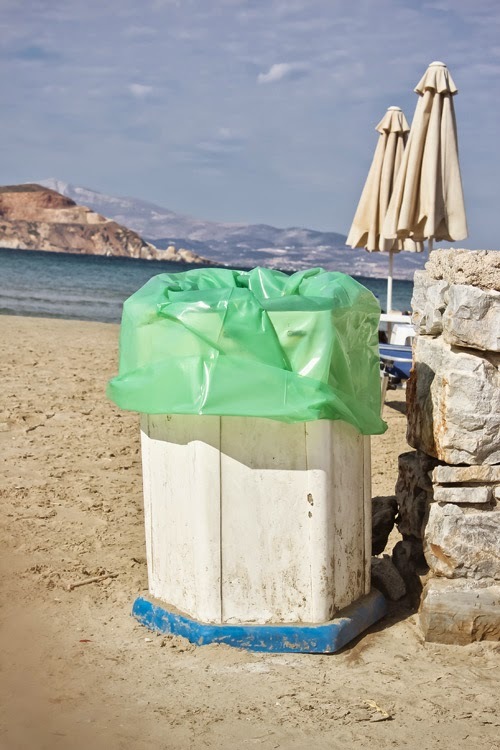 I appreciate that there are a lot of trash bins on the beaches of Greece. St. George is not an exception. 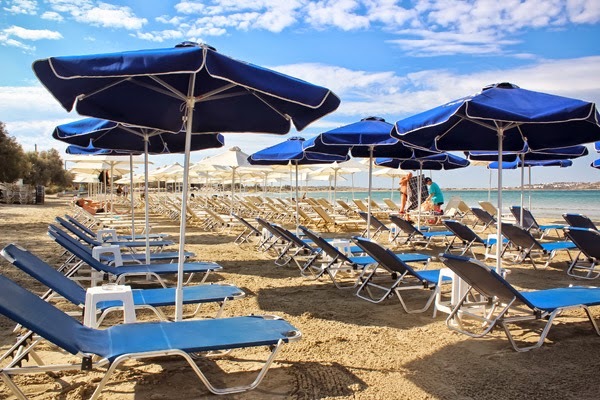 The shore line is lined up with sun beds and umbrellas with over priced eating establishments. Enjoy the walk to the beach. 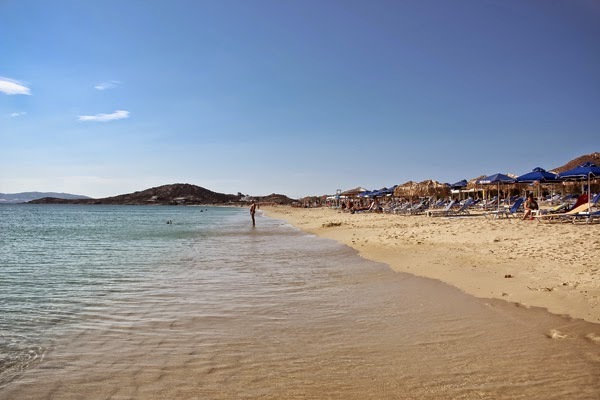 From the “Best Beaches in Naxos” album that I saw, I decided to go to the 2 closest (and prettiest) to Hotel Blue Sky. Agios Prokopios is 4.5 km from our hotel. Our game plan was to visit the furthest one (Plaka Beach below) then visit the nearer one after so that if we encountered any problem going home, at least we were closer to our hotel already. My photos do not do justice to Agios Prokopios because we caught the afternoon sun already. We saw a glimpse of the beach in the morning when we were headed to Plaka Beach and it was much prettier. Agios Prokopios actually looked similar to Plaka in the morning.The water sparkled more in the morning and the sand, more brilliant. 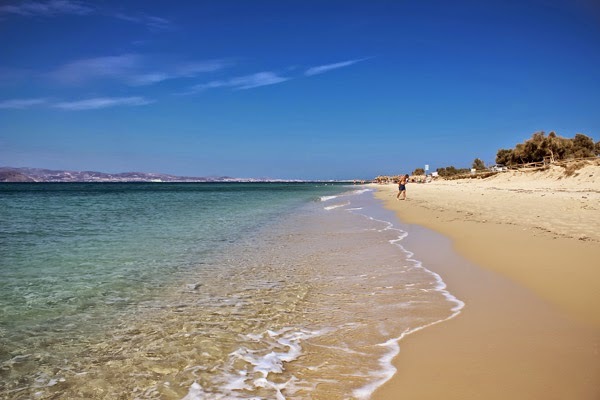 As in Mykonos, beaches photograph better in the morning. 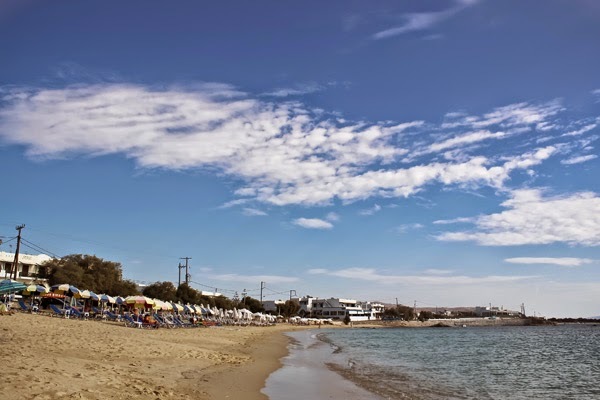 Agios Prokopios feels livelier because of the establishments sprawled along the shore. 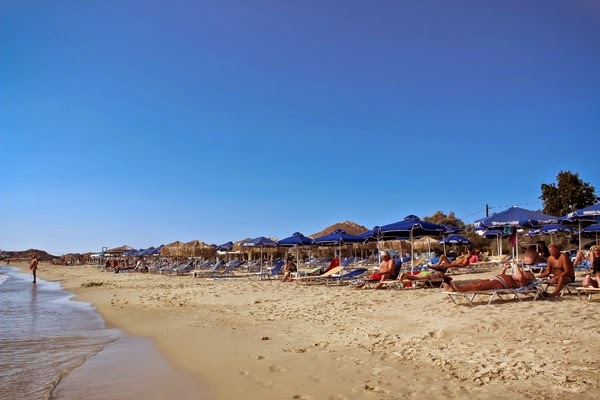 It has a shorter stretch than Plaka Beach making it feel a dash more crowded. 1. Walk to the bus stop near the cinema and bakery. 2. 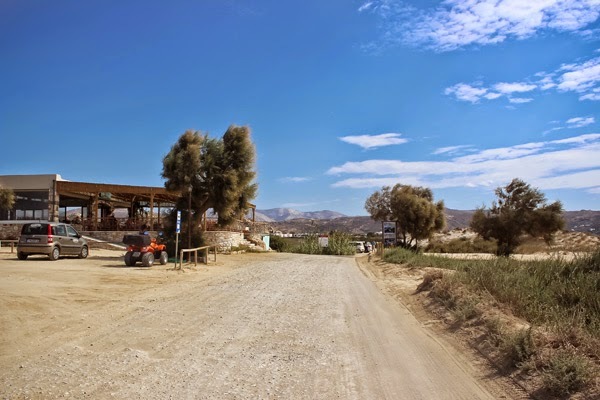 Take the bus headed south and ask to get off at Agios Prokopios. 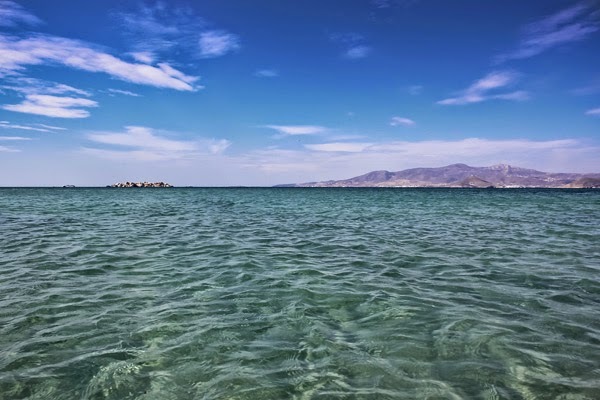 I’ll start by saying this is my favorite beach in Greece. 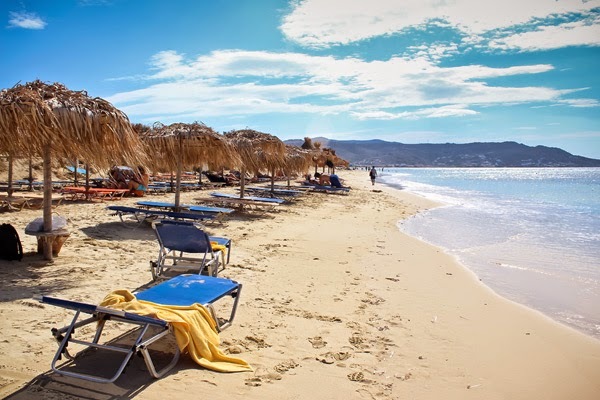 Plaka Beach is bliss. It only cost €5 for the beach umbrellas with a pair of sun beds. That’s half the price compared to Mykonos. 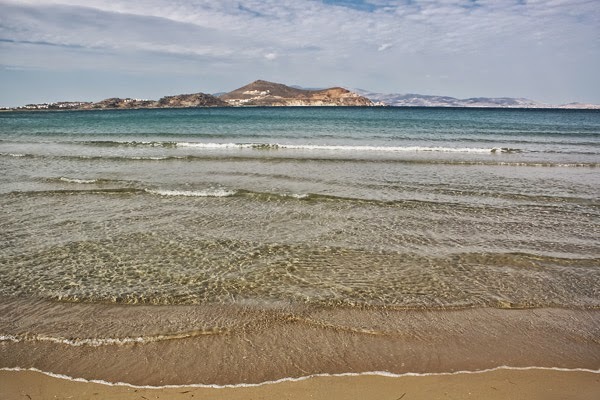 Out of all the beaches I saw in Naxos, it was the least crowded. I think it’s primarily due to the long stretch of the beach. I didn’t even finish walking the whole stretch. Sand texture is better here than at Agios Prokopios. Plaka Beach has polvoron like sand but Boracay still has finer and whiter sand. Be warned, there are nudists here. Haha I was enjoying my walk when I spotted 2 nudists. The further along I went, I noticed there were more people in their birthday suits. I did a u-turn and returned to our area. The atmosphere here is nothing short of relaxing. The superb water was absurdly clear and was an awesome gradient of blues. The waves were calm and you could sit in the ocean for hours, lounging. I brought my rashguard and this time, I was able to swim in the ocean for a longer period of time. 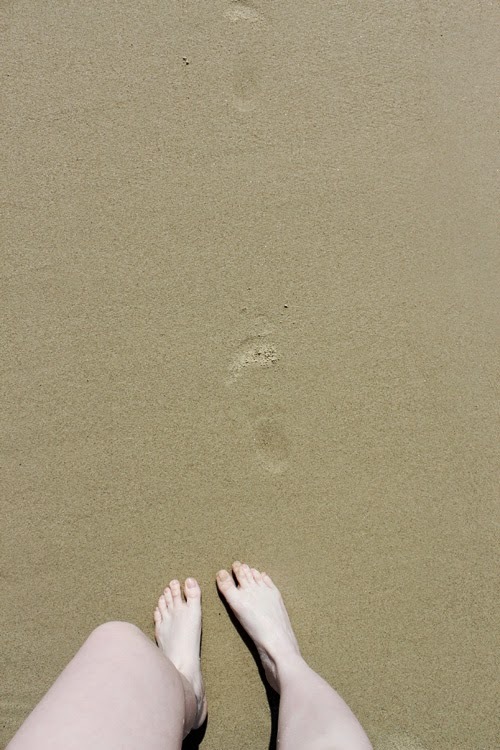 It was the perfect beach experience for me. 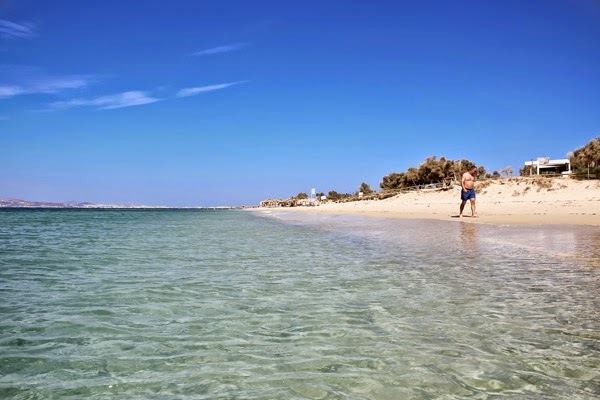 Fantastic scenery giving remarkable views, quick dip in the ocean, great weather for walking the shore and an area of your own to lounge as you please. One small booboo, the buses don’t have a schedule. When we were finished at Plaka, we waited and missed 2 buses. It was piercing hot and there was no bus stop. 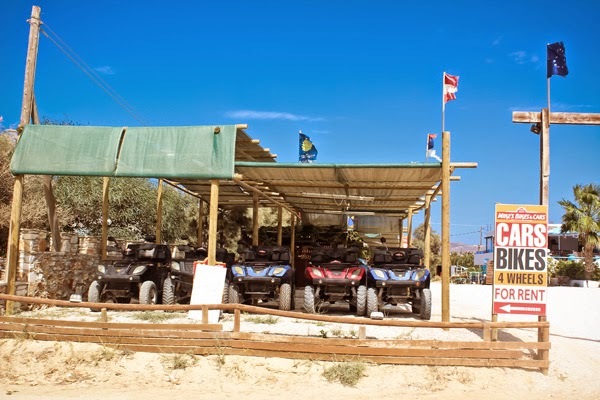 We waited near this ATV rental shop which had a convenience store next to it. When we saw the first bus, we were at the convenience store and the bus did not stop. I tried running after to it but failed miserable. Tip, if you’re with someone or a group best to be patient. A good strategy is to have someone wait near the road (under the tree please) while someone buys supplies at the convenience store. You get your supplies and have someone to stop the bus. No buses missed! 2. 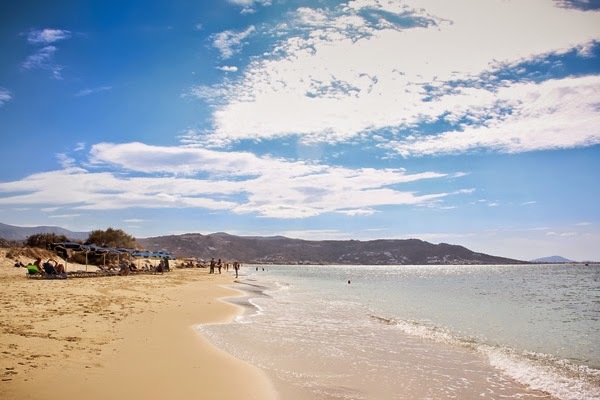 Take the bus headed south and ask to get off at Plaka Beach, fare is €1.80. 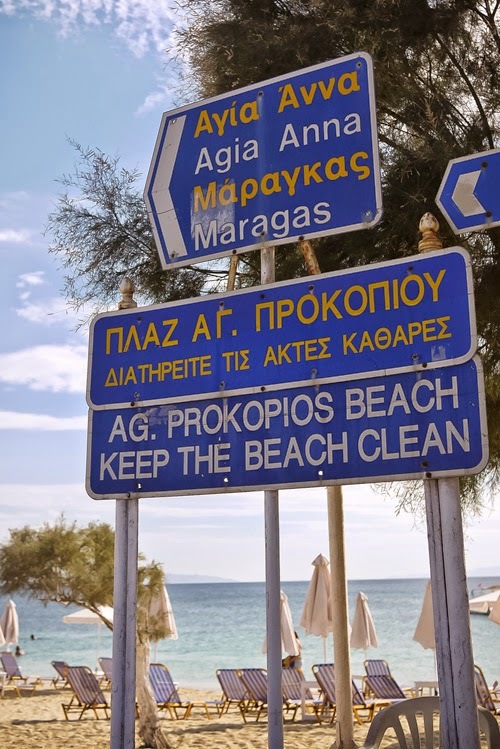 I wanted to visit Mikri Vigla Beach (10.2 km from Hotel Blue Sky) and Kastraki beach (13.6 km from Hotel Blue Sky) but they were too far. 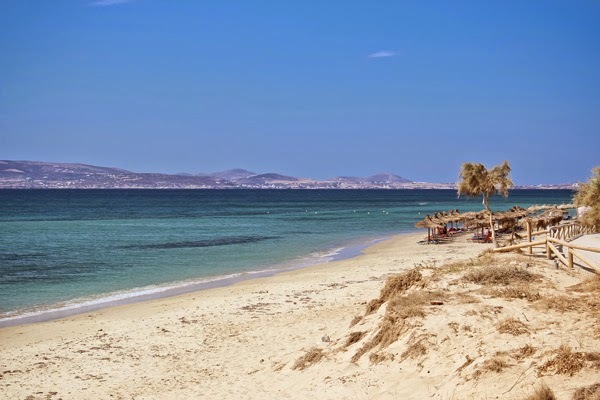 Knowing what I know now, I would have spent more time in Naxos. 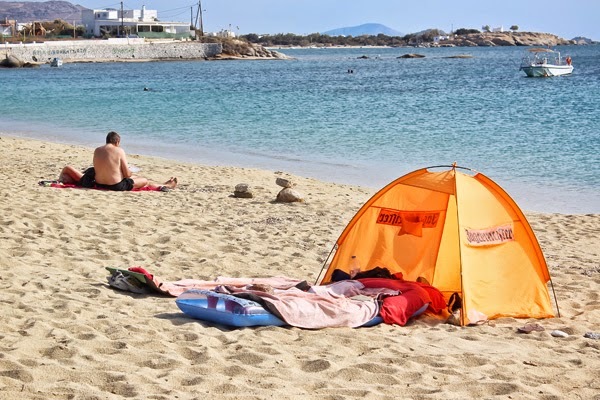 With finer sand than Mykonos and Santorini, Naxos won the heart of this beach lover. That deserves a cartwheel! Wiiiiiihhhhh! P.S. Our beaches still rank number 1 for me.